CERTIFIED! 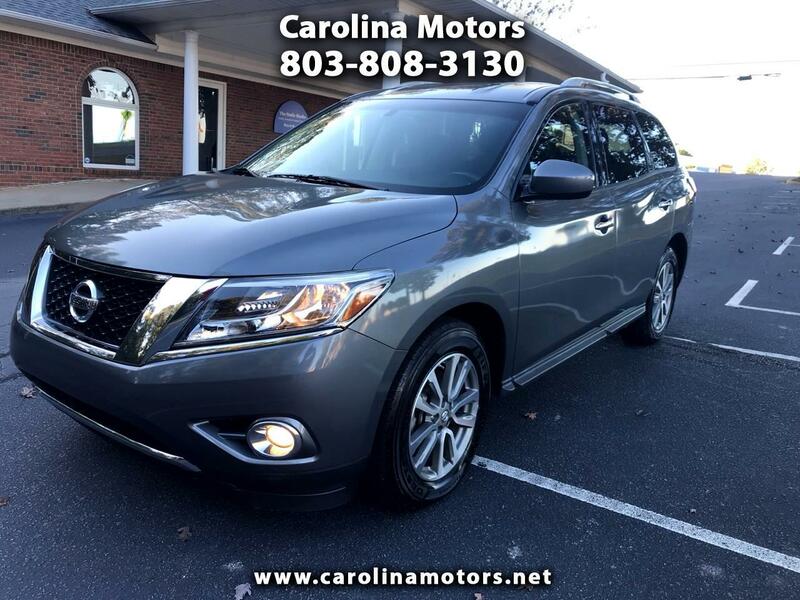 2015 Nissan Pathfinder SV, local trade, power seat, Bluetooth, steering wheel mounted controls, power windows, power locks, cruise control, third row seat, rear air conditioner, USB hook up, reverse camera, great SUV for the money! See free Carfax and more info at www.carolinamotors.net ! Come look at our inventory and let us appraise your trade in. We have over 50 years experience between the both of us. We thoroughly inspect every vehicle that we sell and take pride in every one. We specialize in low mileage and one owner vehicles, such as Acura, Audi, BMW, Buick, Chevrolet, Chrysler, Dodge, Ford, GMC, Honda, Infiniti, Jeep, Kia, Lexus, Mazda, Mini, Ram, Scion, Subaru, Toyota, Volkswagen and many others. We buy clean used cars and trucks from individuals. See our Web-Site for a FREE CarFax! Don't wait, Call James or John TODAY! 803 808 3130! See this and our entire Inventory at www.carolinamotors.net! Warranty Description: AUL Extended service agreement, 90 Days or 3,000 miles, whichever comes first. $100 deductible. See Dealer for Details. * NO closing fees!. Carolina Motors 378, LLC is not responsible for any price discrepancies, statements of condition, or incorrect equipment listed on any vehicle. Car may have minor road chips, light scratches, wheel scuffs, etc. Depending on the age of the vehicle, normal wear and tear should be anticipated. We may or may not have all the keys and floor mats. If we don't will be happy to obtain extra ones for you at our dealer cost. Prices exclude tax, tag, registration and title. The full cash price charged at any dealership depends on many factors, including all products and services bought with the vehicle. It is the customer's sole responsibility to verify the existence and condition of any equipment listed. The dealership is not responsible for misprints on prices or equipment.